While long years of my genryu fishing life, I always tried to go to genryu with some friends. (At least with one friend.) In the first place it was to prepare for the event of an accident, but on the other hand it was for sharing the bliss time such as the beautiful river walk, amazing fishing and joyful camping with congenial friends. Hardships such as tough climbing over mountains or long walks become a fun time if there are fellows. The schools of iwana in the beautiful emerald green pools or great rocky mountain ranges towering over the valley, impressions to see those incredible scenes become double if together with friends. I sometimes went solo keiryu fishing camp when I was younger. I needed quite a courage to enter the secluded mountains alone, and it was good experience that I felt thrill to spend the night alone at the camp site in the valley. The night was darker and longer. I appreciated the visit of morning more than usual, and the light of the sun was more beautiful than ordinary days. I felt like that I cleared one of the spiritual practices and become a bit stronger mentally. It was surely true those experiences gave me something, but after all I think going to the mountain is much more fun together with friends. So today, I want to introduce several buddies who I go genryu fishing trips with. Firstly Kanno-san (Mr. Satoru Kanno) who lives in Fukushima. It has been more than 10 years since I started to go genryu fishing with him. I first met him at the event of the keiryu fishing school for foreign people living in Japan. 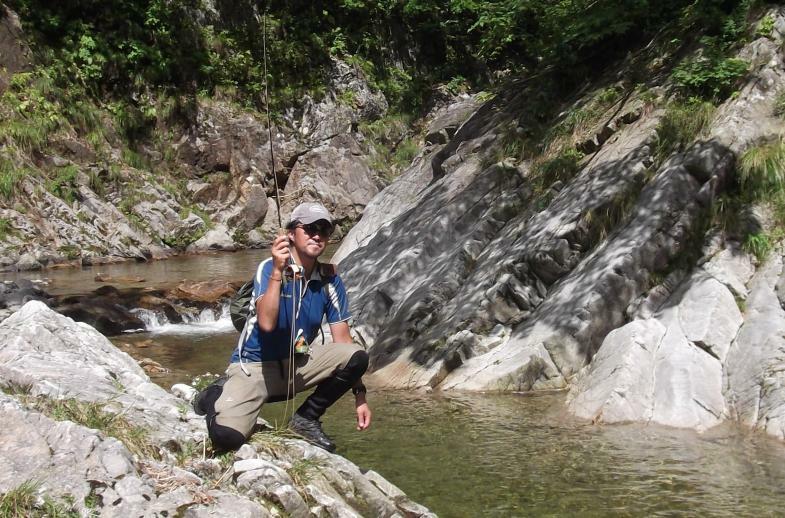 Kanno-san was teaching tenkara fishing and I was teaching fly fishing then. We hit it off immediately at the first meeting and got to go genryu fishing together. Kanno-san likes picking mountain plants in the spring and does mountain stream fishing in the summer. 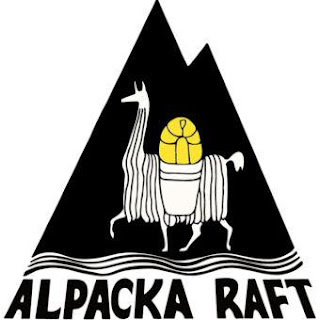 He goes to the mountains to pick mushrooms in the autumn and does Nordick skiing in the winter. Yes, he is playing in the mountains all year round. 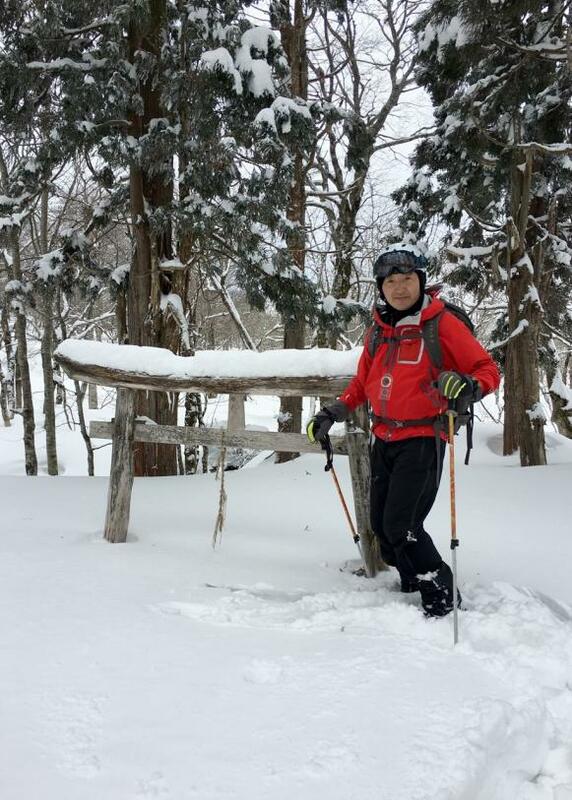 He has knowledge about mountain plants or mushrooms like professional person and has long experiences of mountaineering and mountain stream fishing. I think he is my best partner for genryu fishing. He started fishing from bait fishing and moved to tenkara fishing. Now he also does fly fishing too. He sometimes works as Nordic skiing instructor in the winter. He is also a good cook at camping using mountain cooking ingredients. Next guy is Tsuru-chan (Mr. Tomoyuki Tsurumi). He lives in Tochigi. It is not so far from my home town. 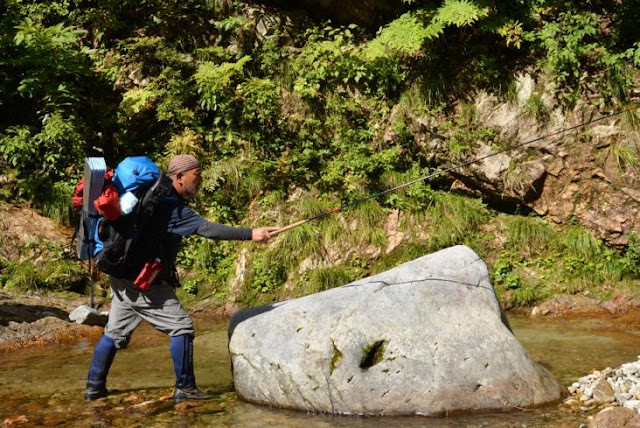 He sometimes does tenkara fishing in genryu but he is a hard-core fly fisher. He took up fly fishing when he was 12 years old. It means he has been doing fly fishing for about 40 years. I met him just by chance near genryu part of Tadami River about 10 years ago. He was with another friend and looking for the trail to one of the good branch stream of Tadami River. I taught the trail and did fishing together on that day and we became friends. He was not doing genryu fishing so much at that time, but I have drawn him into the world of genryu fishing. Now he accompanies my genryu fishing most frequently. He has a work of construction relationship as self-employed. So he has physical strength well and his prowess of fishing is best in the fellow. Recent years he climbs low mountains for training in the winter time, and he is much stronger in the mountains now. I am just leaving behind in the mountains. Besides he started free climbing lately. Tsuru-chan where are you going. 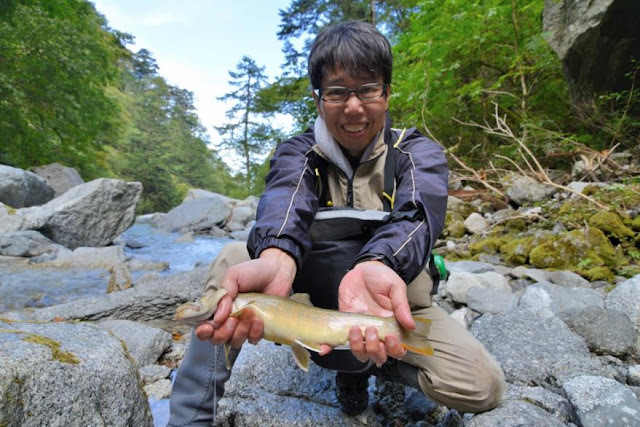 Hama-chan (Mr. Akihiro Hamatake) started joining us for genryu fishing since about 5 years ago. He lives in Tokyo and works as an architect and interior designer. He is a tall guy who is more than 190cm. He was a volleyball player when he was student. I am sure everyone thinks he is the strongest man among us, but he is like lightweight packing mania. He always has the smallest and lightest back pack for the genryu fishing trip. He is an experienced fly fisher too. A professional fly fisher Mr. Kenichi Shiraishi introduced him to us because Hama-chan wanted to go genryu fishing more. He also likes lake fishing and travelling all over Japan searching for big games. He is good at fishing but also he is good at cleaning fish. He always makes sashimi of iwana at the genryu fishing camp. “Iwana no Kobujime(Iwana sandwiched between sheets of kelp)” he made at the camp in the last year was so good. I want to ask him it again in our next camp. Then, Ito-san (Mr. Keiji Ito) who lives in Yamagata. Yamagata is located in Tohoku at Japan Sea side and there are so many good mountains and steams. Yamagata is one of our most favorite prefecture for genryu fishing. He is engaged in agriculture in the enviable environment. 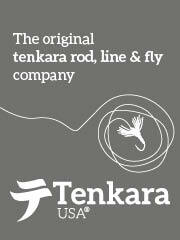 He is a genuine tenkara fisher who has long experience and great passion. 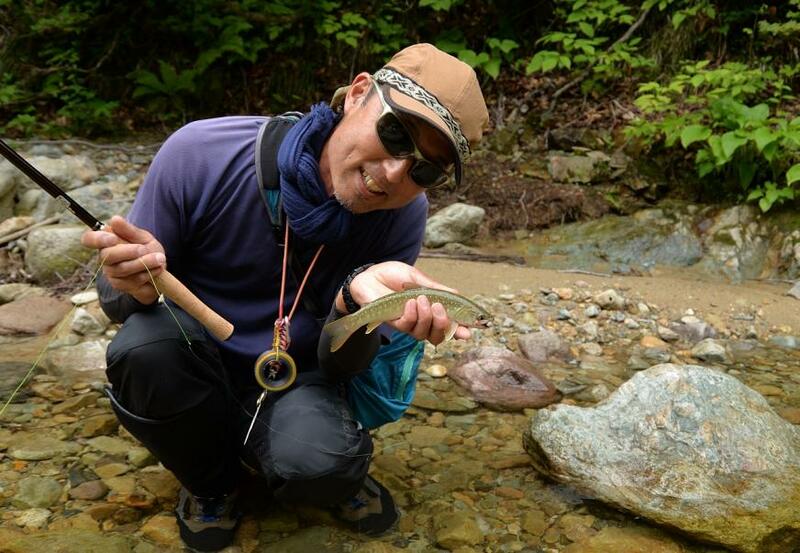 Probably he has the best knowledge about tenkara rods and tenkara line system in our group. 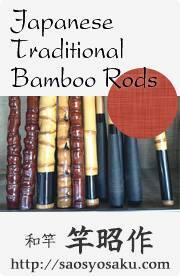 I often ask him for the know-how of tenkara fishing and advices to tenkara rods. 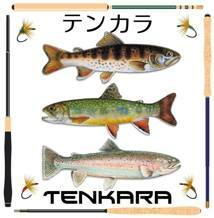 He is a really dependable tenkara fisherman. Finally I want to introduce Takano-san (Mr. Satoshi Takano). He lives in Saitama and works in Tokyo as a company employee. I was acquainted with him by Yuzo Sebata-san’s introduction. He is the quite famous person in keiryu fishing world because he is one of the start-up members of the famous genryu fishing club “Tanidoraku”. Some of you might have seen him on some articles of Headwater magazine “Keiryu” or in some genryu fishing sites. He is a veteran keiryu fisher who has more than 25 years of experience. He normally does bait fishing, but sometimes enjoy tenkara fishing recently. He says that it is the influence of Sebata-san. He is also a professional-grade photographer. He has offered many photos to Headwater magazines or other fishing magazines and books. 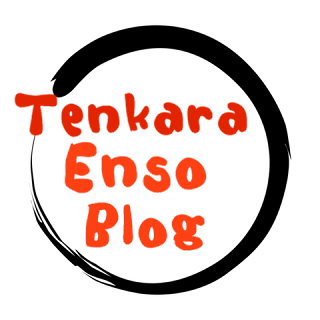 Home page of Tanidoraku has very rich contents and it is updated on a fairly regular basis. You may already know the home-page of Tanidoraku. It is written all in Japanese unfortunately, but I think you can enjoy it very much because the articles have lots of beautiful photos. Please visit http://www.tanidoraku.com/ one time. Especially the following fishing reports corner is very good to look through. Now some of streams in Japan are opened for fishing already. I might go my first keiryu fishing in a couple of weeks. It is still too early to go to the mountain streams in high elevation, but I must talk with the friends to plan and arrange our genryu fishing trips for this season slowly.